Iran's New President Viewed As A Pragmatist : Parallels Hasan Rowhani, a midranking cleric, has been a politician since the 1979 revolution. He backed a violent crackdown against the pro-democracy student movement in 1999. But during the campaign, he appeared as the most charismatic and pragmatic of all the candidates. Calling it an era of wisdom and moderation, Iran's new president, Hasan Rowhani, vowed to integrate the country back into the international community and asked Western nations to adopt a more "respectful rhetoric" toward Iran. His triumph Saturday with 18 million votes, slightly over half of the cast ballots, surprised many Iranians who had suspected that the leadership would repeat the controversial elections of 2009 that led to the re-election of Mahmoud Ahmadinejad. By accepting Rowhani's victory, the regime may be taking a step to restore some of its lost legitimacy. The massive rallies followed by a bloody crackdown in 2009, as well as international sanctions over Iran's nuclear program, have led to a political and economic crisis. Many blame Supreme Leader Ayatollah Ali Khamenei for the debacle and believe that Rowhani, a veteran negotiator, can provide the opportunity for him to fix his image. Rowhani , a midranking cleric, is not a reformist even by Iranian standards. He backed a violent crackdown against the pro-democracy student movement in 1999. A politician since the 1979 revolution, he has served as a member of Parliament and speaker of National Security Council. In the 1990s, he completed a doctorate at Scotland's Glasgow Caledonian University. But during the campaign, he presented himself as a moderate, both on domestic and foreign policy, and appeared as the most charismatic and pragmatic of all the eight candidates — five of them ardent supporters of Khamenei. He appealed to the young electorate that is vying for more political and social openness, saying that even in 1999 he tried to block more violent measures. Another candidate, the former Tehran police chief, Mohammad Baqer Ghalibaf who came second with 15 percent of the votes, had boasted in his campaign that he personally led the crackdown in 1999 as well in 2003 and 2009. "I am not a general," said Rowhani sarcastically to Ghalibaf during a national television broadcast. "I have studied law." On the nuclear issue, he dismissed Iran's uncompromising position during a televised debate and said: "Of course it's good for the centrifuges to spin, but people's daily lives should run, too." He was referring to Iran's uranium enrichment activities that the country has adamantly refused to halt. The technology can be used to make nuclear fuel as well nuclear bombs if uranium is enriched to high levels. U.S.-led sanctions are squeezing the economy. Oil revenue is down by half and inflation is at more than 30 percent. 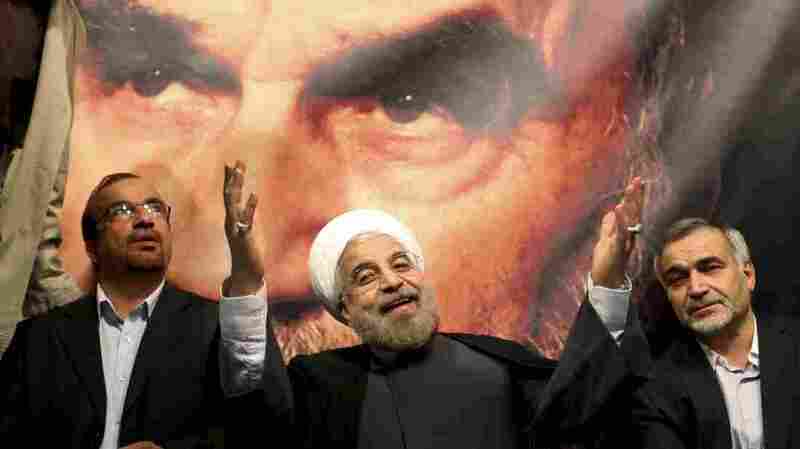 Rowhani's victory has bolstered optimism that he is capable of ending the nuclear standoff with the West. As the country's first nuclear envoy, he signed the additional protocol to the nuclear nonproliferation treaty, allowing inspectors from the U.N.'s International Atomic Energy Agency to visit Iran's nuclear facilities. Further, Iran suspended its sensitive uranium enrichment activities. Those measures built trust around Iran's nuclear program until Ahmadinejad reversed them in 2005. Khamenei, who has the final word on state matters, has repeatedly dismissed compromise over Iran's nuclear program. But the president sets the tone for domestic and foreign policy and can create room for moderate politicians to persuade Khamenei to change course. On Saturday afternoon, millions appeared on the streets in green, the color of the protest movement after the 2009 elections, and purple, Rowhani's campaign color. They chanted slogans, demanding the release of hundreds of political prisoners, including two opposition leaders, Mehdi Karroubi and Mir-Hussein Moussavi, the former presidential candidates. Iranian media also hailed Rowhani's election. The daily Jomhuri Islamic, which was once close to Khamenei, wrote in an editorial on Sunday that the vote for Rowhani meant "yes to moderation and no to extremism." "The solid vote for moderation showed that Iranian people are tired of any kind of extremism and no longer accepts those policies," the newspaper said.